Recently discovered that popular series of Logitech’s remote controls Harmony has IR codes to control Video Disk Recorder (VDR) box. 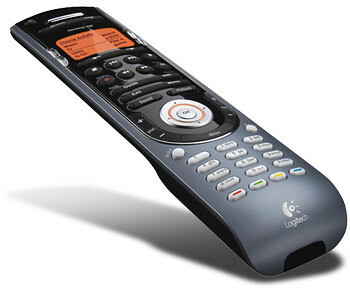 To get them to your device just download new remote using Logitech software choosing type PVR, producer KLS and model VDR. Also you can use this config file for LIRCd. Have fun! CommandIR 2 – a second generation of hardware extension for Linux media PC’s, was reviewed on the MythPVR.com. It allows to control Linux box itself and any A/V equipment via IR. The CommandIR 2 is equiped by four independently controlled IR blasters, on-board IR receiver, wired IR receiver (optional), six software controllable LEDs (they can be used to indicate something like starting recording, high level of system load etc) and USB port to connect the PC. The CommandIR 2 is design specially for Linux. MythTV supports it from the box. But for other Linux distributions the CommandIR 2 can be configured manually. The CommandIR 2 seems very interesting devices to extend control of home entertainment system. It’d be nice to add it into LinuxMCE since it already supports GC100, IRTrans USB, Tira-2.1 and USB-UIRT. Using Nokia770 or its next generation N800 is limited just your imagination and a little bit of hardware issue. The new Maemo application Ir Remote Control can be a good confirmation of that. The application gives a easy way to use Internet Tablet as remote control for your A/V equipment and home appliance. The first versions of the Ir Remote Control used a dedicated PC with running LIRC server there. The latest one has its own LIRC back-end and supports IR Trance Ethernet to send IR command via LAN. – Vol+ – desired command, in that case – increasing of volume. So, using Nokia770 or N800 together with IT Trance Ethernet and Ir Remote Control gives you an elegant and efficient way to control your IR stuff. iMON IR receiver and VFD display are used by many producers of cases for HTPC. One of most popular of them is SilverStone. LinuxMCE doesn’t support them from the box but there is a way to add it into system. That howto explains the steps which should be performed to do that. In the new template add a property – Configuration and put there LIRC configuration file for iMON PAD, for example, you can use that one – iMON PAD lircd.conf (1931). Go to Wizard :: Media Directors and add iMON PAD remote control by pressing the button ‘Add Remote’ on the bottom of the form. After that all needed LIRC packages will be downloaded and installed automatically. You shouldn’t do that manually! and file /etc/lircd/lircd.conf should contain the content of iMON PAD property Configuration. To test you remote control you can use utility irw. Just run it and press a few buttons on the remote. You should see the actual IR command as irw output. download sources of LIRC 0.8.2 and diff file from Ubuntu site. and define imon driver in the LCDd.conf. Download the latest snapshot from venky.ws. Go to the lcdproc-X.X.X-imon directory, apply this patch Patch for LCDProc-0.4.5 (1065) to avoid display good bye message after PC will be switch off. or get already patched version - Patched iMON LCDProc 0.4.5 (993). and run update-rc.d lcdd defaults to create symlinks to start/stop lcd daemon and client. Make a symlink: ln -s /usr/local/sbin/LCDd /usr/local/bin if you install LCD in the default path. To get more debug information in the /var/log/syslog. You can find the setup options in Utilities/Setup->Setup->Appearance->LCD device display. Tick the box Enable VFD device and a few options appear. To bring some data to VFD display mythlcdserver should be run. Then install created package and restart VDR. Now your VFD display should display information from VDR. You may use my built package for AMD64 - vdr-plugin-lcdproc AMD64 (935). LIRCd needs /dev/lirc0 and LCDProc - /dev/lcd0. If you cannot see them then something is wrong. Check /var/log/syslog. It can contain an error message about problems with LIRCd config file. This is a common case (at least for me). Check connection iMON VFD with USB port. I spent some time to figure out why my remote doesn't work but iMON VFD USB cable was plugged not very well.